A historic lakefront hotel in Wisconsin’s capital has reopened after a two-year, $100 million renovation. The Edgewater, which sits on Lake Mendota in Madison, is located about five blocks from the century-old, domed State Capitol building and a mile from University of Wisconsin-Madison. Wisconsin’s second-largest city regularly ranks as one of the country’s best places to live, which makes it an ideal travel destination as well. 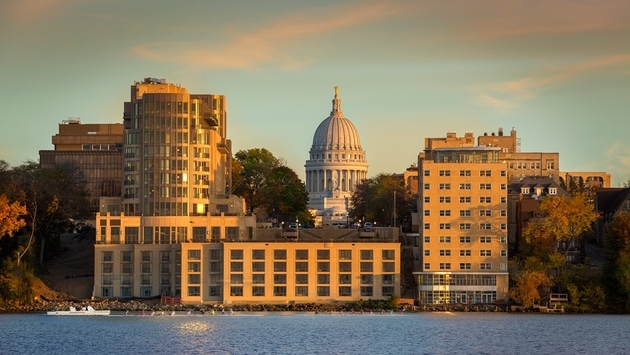 Busy with students and legislators, Madison also is known for hip shopping, lively nightlife, five lakes, hundreds of miles of bike paths and the mammoth farmers’ market (the country’s largest producer-only market). A top-notch foodie destination, the city was a pioneer in the farm-to-table movement but bratwurst, beer and cheese curds are always within reach. Now Madison once again has its grand resort. Built in 1948, The Edgewater quickly became a Midwest hot spot, attracting the likes of Elvis Presley, Sammy Davis Jr., Bob Marley and Elton John through the years. While the renovation updated the interior and added cutting-edge technology, the design firm Elkus Manfredi Architects made sure to preserve the Art Deco architecture and the exterior of the two original buildings. 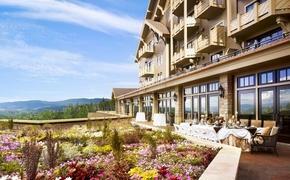 The property is a new member of Historic Hotels of America. The renovation added the new Wisconsin Building hotel tower, two ballrooms, multiple indoor and outdoor event spaces, restaurants, a spa and a one-acre public plaza. The three buildings offer 202 guestrooms, two presidential suites and 10 studios with kitchenettes, all with lake, Capitol and city views. Located on the 12th floor of the Wisconsin Building, the two presidential suites have curved floor-to-ceiling glass walls with lake views. Each 1,000-square-foot suite has a dining room, living room, bedroom, travertine tile-and-marble bathroom with walk-in shower and soaking tub and an additional guest bathroom. The Lakeview Terrace rooms, a spacious 380 to 460 square feet, boat outdoor terraces on the eighth floor of the Wisconsin Building and balconies on the 12th floor. The hotel also brings its storied history to life in a 90-foot interactive media wall with video monitors, still photographs and historic artifacts. The Edgewater also has a spa and fitness center with lake views and a Jacuzzi relaxation pool. Dining options include The Statehouse signature fine-dining restaurant, The Icehouse food hall and a casual café for coffee or quick meal on the spot or to go. In the spring, The Boathouse casual eatery will open and offer Wisconsin fare. It will overlook the lake and a planned 150-foot pier scheduled to open next summer. The Edgewater also offers 45,000 square feet of meeting and special event space, including the Grand Ballroom with 16-foot windows overlooking Lake Mendota, the 15th-floor Sky Bar atop the Wisconsin Building and the intimate Red Crown Club atop the Langdon Building. The hotel is offering introductory advance-purchase rates starting at $199 per night when booked by Nov. 7 for stays before April 30. Click here for more information.